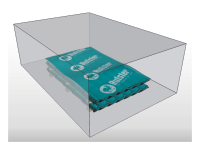 The RUFSTER products need to be transported on solid and stable platforms. In order to avoid damaging the surface of the products, it is recommended they be kept in the original packaging or covered with protection foil. 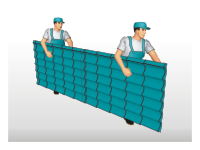 The unloading of the pallets should be done by forklift or special lifting equipment. 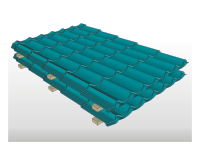 The metal roof tile and trapezoidal sheet panels should be manipulated in vertical position, along their length, in order to not distort the panels. We recommend the use of gloves while manipulating the products and special attention at the sharp corners to avoid scratches. The products should be stored in their original packaging on solid, dry surfaces, kept away from excess moisture. The storage surface should have a low slope, it should be ventilated and without direct sunlight. 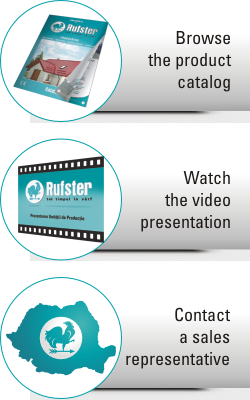 The RUFSTER products should not be stored longer than 3 months. It is necessary that the products are installed within 3 months from the date of purchase. The Warranty will be void if the products are not installed in this time !